Let me ask you something - do you check every, single receipt you're handed to make sure that you were charged the correct price for what you bought? If you honestly answered "no" to this question, then you may be losing out on your hard-earned money. Far too often shops, restaurants and service providers unknowingly, or even knowingly, charge you a different price for a product or service than what you expected to pay based on the offer advertised or the price sticker on the shelf. This happened to us this evening. My lovely in-laws offered to pay for our meal out; when the receipt came after my mother-in-law paid, I reached for the receipt (I hope she didn't mind!) to check that we were charged the correct price for our meals. We went to a pub restaurant that a friend had recommended that had select £6 meals Monday-Friday all day, which my in-laws took advantage of. My husband and I ordered a curry meal "deal" that included a drink. So we were being careful with the meals we purchased. When I reached for the receipt, the first thing that caught my attention was that there were too many items on our bill. I scanned down the list of foods on the receipt. Ok, actually we did have all of that. But something still didn't seem right. Then I spotted something suspicious: my daughters' children's meals were itemised instead of just saying something like, "Kids meal £5.99". So out came the calculator on my mobile. I added up the prices of each of the items on the kids' meals, and just as I thought, we were charged £1.06 more for each meal. Whoa! 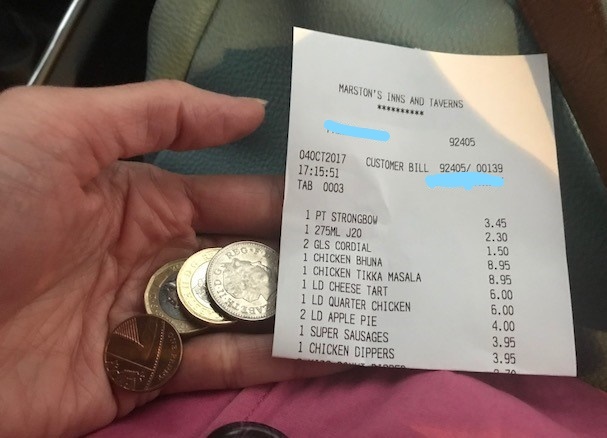 Of course, I went up to the till... waited until someone was able to help me... she blah blah blahed about how something was taken off but they had forgotten to take off something for the kids' meals... blah blah blah... just give me the £2.12 you overcharged my in-laws already! I did walk out of the pub with a huge sense of pride knowing that I hadn't let the restaurant get away with overcharging us. So, what can you do to find some extra pennies? Ideally before you pay for something, check over your bill to make sure that all of the prices/charges are as you expect them to be. If you aren't able to check your bill before you pay, such as at the supermarket, step to the side after paying and quickly check that you were charged the correct prices. If you are in a hurry then, at least check the receipt when you get home... and add it to your budget. Oh, and do speak up. It is worth it. Try not to be embarrassed about asking for your money back or a price check. They sure weren't too embarrassed to take your money or wrongly charge you! The more you practice checking your receipts and, if need be, getting some money back if you were wrongly charged, the sooner it will become a habit and you'll be finding the pennies to put back in your pocket.